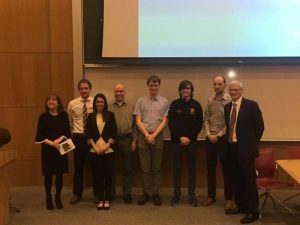 On Thursday 28 February the Irish Meteorological Society took a trip away from its usual Dublin base to present an evening of talks on the theme of weather and climate at University College Cork (UCC). The event was organised with the assistance of the UCC Physics and Astronomy Society. An attendance of about seventy people heard five presentations. First up was Dr Lucia Hermida of UCC who spoke about her area of specialty which focuses on the human influence in extreme weather and climate events. She was followed by local pharmacist, Tadhg O’Shea, who gave us a very interesting talk about the efforts of the local community from Blackpool in Cork City – they have had to take the initiative to protect their area from the effects of some of that extreme weather – it is afflicted by periodic flooding. 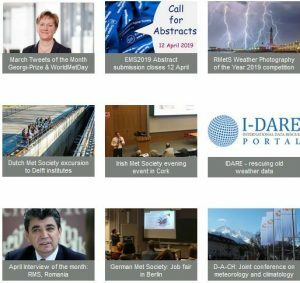 After a break for tea and coffee and mingling, the second half kicked off with presentations by two staff working at Met Éireann. Evelyn Cusack, Head of Forecasting, gave a talk on Ireland’s weather through time, while Dr Colm Clancy, returned to his Alma Mater to provide some insights into his work on numerical weather prediction. Dr Andy Ruth of UCC rounded off the night with an energetic and very well-received lecture on how the sun generates and influences the Earth’s weather. The crowd was so impressed with Dr Ruth that many were left considering whether to submit an application to study physics at UCC! Tony Maguire of the IMS facilitated a Q&A session with all five speakers before the event was wound up to the satisfaction of all. The night was a great success and the IMS plans to hold more talks outside of Dublin with the possibility of starting a local chapter in Cork.